The singer has been clouded by speculation that he is set to drop a new project, and now he has confirmed it. In a post on Instagram, the singer uploaded a photo of the handwritten tracklist, signed at the bottom. “King Don Come” album will contain 10 tracks with collaborations from Harrysong, Wande Coal, and a few unnamed acts. It contains single ‘Emergency’, and a reworked version of ‘Focus’ named as ‘Turn down for what’. Interestingly, his 2012 single ‘Oliver Twist’ makes the list. So also does the 2013 highly successful ‘Top of the world’, which was performed at the closing ceremony of the 2013 African Cup Of Nations (AFCON). 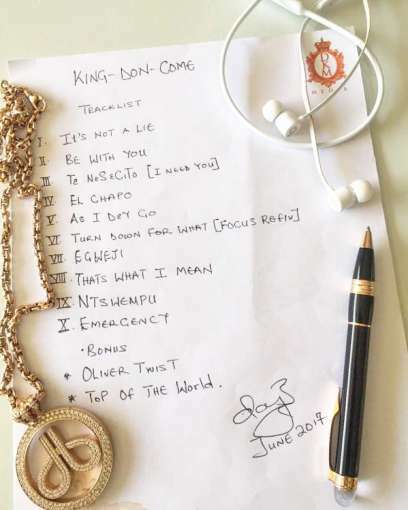 The new project will be D’banj’s forth solo studio album. It follows an impressive and highly successfully discography, which include “No Long Thing” (2005), “RunDown Funk U Up” (2006), and “The Entertainer” (2008). The album is set to be released in June, 2017.